The Historic Town of Vigan is the best-preserved example of a planned Spanish colonial town in Asia, including the historical checkerboard street plan. Vigan differs from Spanish colonial towns in Latin America because its Latin tradition is tempered by strong Chinese, Ilocano and Filipino influences. Inscription of Vigan as a WHS was rejected earlier, in 1989, because it couldn't compare with Spanish colonial cities like Cartagena (Colombia) and Trinidad (Cuba). I haven't been to those two places, but I've seen many other Latin American colonial towns. Like those, Vigan has the checkerboard street plan, the central plaza (even two of them) and the cobbled streets (well, one street). Although it's not spectacular on the Spanish-colonial scale of things, Vigan is quite a remarkable oasis in the Philippines. In general, not many historic buildings are left, after centuries of earthquakes, fires and WWII (the latter having been very harsh on the Philippines). Here in Vigan they've decided to save whatever is left. The historical buildings are in various states of (dis)repair, but their ensemble has great atmosphere (added by sealing one street off for motorized vehicles). As the ICOMOS report remarks, Vigan should actually be compared with other Asian colonial trading cities like Hoi An, Malacca and (the more brightly painted) Macau. One of the joys of Vigan is its old villas (mostly dating from the 19th century), which are open to visitors. You can even stay at one (Villa Angela), which I did and can only recommend. One really feels like the lady or the lord of the manor there, sitting, eating and sleeping at furniture that you normally aren't allowed to touch in a museum. I visited Vigan in 2007. Vigan is a Spanish colonial city located the north of the island of Luzon. If you want to understand the link between the Philippines and Latin America, I'd suggest visiting Vigan. If it weren't for the people, you might think that you were in Mexico or another former Spanish colony in the Americas. Automobiles are not allowed in the old part of town, so the historical parts are pedestrian only. Read more about the Historic City of Vigan on my website. I'm not sure if my thoughts about Vigan can be included here because as much as I would like to but I have never been to this quaint "old world charm" town of the North. Although I have been to Taal Batangas and Pagsanjan in our country and Saint Augustine in Florida before which are all old colonial towns comparable to Vigan, unfortunately I have never had a chance to visit Vigan. My views about it are based on stories I got from my eldest sister who lived in up there for some years ( in the 1980's )and she even learned some Ilocano enough to understand and speak the dialect. I also have admired countless photos and read many articles and personal reviews of those who had the opportunity to see and experience Vigan. I believe Filipinos from all over should be aware and understand the priceless value of our only UNESCO World Heritage City in the Philippines because when we do regard it as such, it contributes to a strong sense of national identity and pride. Vigan may not be as spectacular as other well-preserved Spanish colonial towns found in Latin America but we must recognize that it is the only one of its kind in the entire country and perhaps in the whole of Asia. Some say that it is not Hispanic enough like those in Spain, others think it is in need of a major "facelift" or something but Vigan is unique and special as it is. After all, it is not just a single old church or fortress but an entire town that we all can appreciate and be proud of as a race and as a nation. I visited Vigan just two weeks ago. My memory and impressions are overall indeed tilted to the positive side. I found it hard to articulate succinctly. Let me just give one point. In terms of showing information relevant to the visitor clearly, Vigan probably does a marvellous task in one stroke, not often found in Asian towns of Vigan's size. The map produced by the city government is very understandable, helpful, nice looking, convenient. You don't even have to get a paper copy. At the intersection of Crisologo and Liberation there is a very clear map on a wall. Always get back to this intersection and you will find your way in Vigan. The reason why many people can't seem to appreciate Vigan is because they just zoom in to Calle Crisologo - forgetting that the the whole town is inscribed as WHS. I can't blame them though as even the local promotion of Vigan as a heritage site is only focused on that narrow street. In fact, it is one of the few towns where in the whole area is under the WHS inscription (others have specific areas - usually their old districts, some only have designated monuments such as churches and select old buidlings). So, how should Vigan be appreciated? The beauty of the trading town of Vigan is in the urban planning utilized in designing the place. It happens to be the best Spanish colonial planned town in Asia. 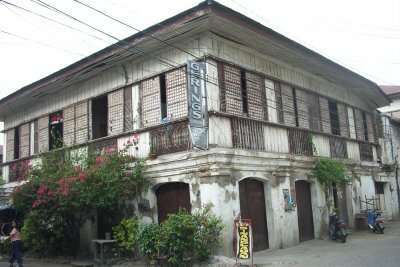 Sadly, other parts of Vigan are neglected already and are not highlighted for their cultural heritage, and importance. Recently, there was the introduction of the Vigan River Cruise - though i have not yet personally tried this - that goes through the history of the town with presentations, cultural shows, and lectures. It is interesting to note that the cobblestone street of Calle Crisologo is already a reconstruction - the stones were dug under 3 layers of modern concrete streets and later on put together again to make the present old pathway; and that the Meztizo District's old colonial houses (which you must admire in quantity! don't have foundations - so, if you were superman, you can literally push all of the houses without heavily destroying the structure. As with any trading colonial town, the old houses used to be painted with pastel colors, similar to its Latin American counterparts. Moreover, a closer inspection of the houses would suggest that they possess stronger affinities to Chinese architecture than European. Ask around what a ventanilla is - that's uniquely a Filipino touch to the houses. Notice also how the cathedral and the old bishop's palace are adorned with Chinese Fu dog statues. 30 minutes south of Vigan is Sta. Maria Church, and 1.5hr. to the north will lead to you to the magnificent Paoay Church. 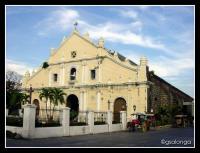 These two WHS churches are under the inscription 'Baroque Churches of the Philippines'. I visited Vigan, Ilocos Sur, Philippines in February 2006 with my classmates in doctoral class. It was an exhausting trip from Bicol Region to Vigan. The ancestral houses were located in one block. The governor preserved the heritage houses. This site is frequented by the tourists. Coaches pulled by horses are used when strolling the area. It was really a good experience actually seeing the site. One will never know what it is like to be a Filipino until one has visited historic Vigan. I have lost count of the many times I have traveled to Vigan, but my enthusiasm for this charming town has never waned. This Christmas 2008, my visit is tinged with nostalgia because I am traveling only with my three granddaughters, whose last visit was 7 years ago. About 400 kilometers from Manila is the UNESCO World Heritage Site of Vigan. On 2 December 1999, this historic town was inscribed in the World Heritage List as the best-preserved example of a planned Spanish colonial town in Asia with a unique European atmosphere. In the Philippines, it is the oldest surviving Spanish colonial city in the Philippines. On the first day of our Christmas holiday tour, we revisited several landmarks and interesting places around the town on a horse-drawn calesa: the old Bantay Church and its famous belltower, the Pagburnayan (stone jar-making factories), the Hidden Garden in a remote barangay, Crisologo Museum, and the old streets in Mestizo District leading to Plaza Burgos and Plaza Salcedo. The Shrine of Nuestra SEÑORA de la CARIDAD in Bantay is home to the venerated our Lady of Charity, patroness of Nueva Segovia. Built in 1591, the church features earthquake baroque and Gothic-influenced architecture. Its belfry located a few meters away was used as a lookout point, and the site was a favored location for many local films. At the Pagburnayan, we witnessed a demonstration of the making of burnay potteries. The burnay is an earthenware jar crafted by a potters hands with the aid of a potters wheel. It uses fine sand (anay) as a tempering material and fired at a high temperature in a huge brick-and-clay ground kiln that makes it harder and more durable than other terra cotta. The local bagoong (fish sauce), sugarcane vinegar and basi wine would not taste as good if not fermented in stoneware burnay jars. The Hidden Garden is a vast landscape of nurtured lush gardens of bromeliads, ferns, palms, bamboo and bonsai. It boasts of large potted bird's nest ferns, bromeliads girding a miniature waterfall or providing ground cover for a clump of bamboo, air plants growing on driftwood, and bonsai and ornamental stones dividing a pathway. On the way to Crisologo Museum, we passed by the Simbaan a Bassit, the local cemetery chapel. 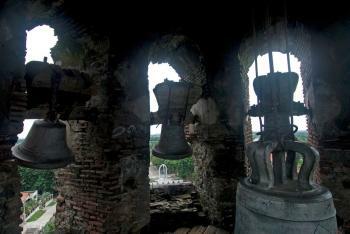 Built in the 1850s, the uniqueness of the chapel lies in its being the only one in the region having an espadaña hung with bells. The Crisologo Museum is an old two-storey building of durable concrete and hardwood, with colintipay windows at the second floor, and thick walls made of bricks, iron and steel window grills at the ground floor. Besides its rich collection of articles of historical value, antique furniture, santos (icon), it houses Congressman Floro Crisologo's memorabilia. Mena Crisologo Street is the most famous cobblestone street of Vigan on the way to the town plaza. This most photographed street is lined with well-preserved houses now turned into museum shops, cafe, or tourist inns. Day or night, stepping into this street of yesteryears brings back a dose of melancholic nostalgia. We stayed at our family's ancestral house restored by my husband's parents in 1986 and named in memory of their mother, Dona Angela Verzosa y Villanueva. Villa Angela Heritage House is a charming, beautiful old house, filled with traces of the past. Located in the central part of Vigan, it was built by Gobernadorcillo Agapito Florendo y Bonifacio, who was a gobernadorcillo of Vigan, La Ciudad Fernandina, in 1859, and his beloved wife, Donya Maria Villanueva, and in time, was inherited by their grandniece, Donya Angela Villanueva y Florendo (married to Don Pastor Verzosa y Florentino), after whom this heritage house was named. Her youngest son, the late Engr. Candelario Villanueva Verzosa, together with his wife, Dra. Purificacion Lahoz Verzosa, painstakingly undertook the restoration of the house to preserve it as a lasting memento. It now serves as the family's repository of antiques, family memorabilia, and historic relics of yesteryears. Among its prominent celebrity guests include Tom Cruise, who stayed here while filming his movie Born on the 4th of July. 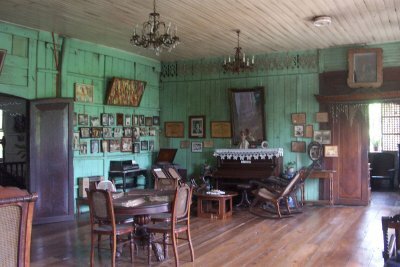 The house was the setting of some memorable films like Jose Rizal, Gumising Ka, Maruja, Noli Me Tangere, and the TV series Ana Karenina. Visited Vigan last March (2009). 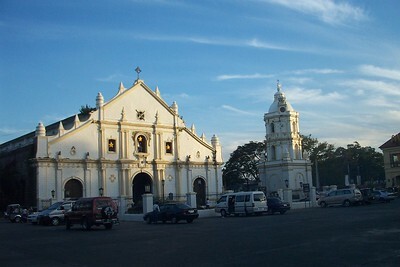 The city is about two hours from Laoag - the capital of Ilocos Norte. The Cordillera Inn along Calle Crisologo is highly recommended. They have cozy rooms and friendly staff. Plus, you'd be staying in one of the old heritage houses. The calesa ride is 150Php for an hour. The driver can take you anywhere in town. Usually, the drivers would recommend going the Baluarte (a small zoo) but I found the place rather disappointing. Stick to the ancestral houses. In school, Vigan was compared to other historic towns in the country - Pagsanjan, Laguna; Intramuros and Taal, Batangas. The latter two were rejected for inclusion in the Heritage List. I wonder what the specific reasons were and if it is possible to submit Pagsanjan town, too. The most enjoyable part of visiting Vigan was riding around in a horse-drawn calesa past all the old crumbling buildings. At one point were were held up by a noisy and colourul funeral procession. The calesas were not expensive either. Vigan is neither imperial nor grand. And to be honnest, the houses (its main WHS draw) are rather stark compared with the more flamboyant ones found in other historic towns across the Philippines. This is a reflection of local Ilokano culture- a group of people known not exactly for being fanciful but more for being frugal. But what makes Vigan unique is the concentration of Hispanic influenced (with Asian details) period houses perhaps unmatched anywhere else in the country. I particularly liked the pastel-colored Spanish-colonial cathedral ith Chinese lions and a pagoda-inspired bell tower(above) facing the main plaza fronting an American-colonial government house. The town is small enough to be explored in a day and the nearby Santa Maria church (another WHS) provides for an excellent day trip. Of course, a trip that lasts more 10 hours (thats the distance it takes to drive from Manila) should be worth more than that and it is! The excellent views of the South China Sea meeting the town's Abra river is stunning. As are the beaches further north (Pagudpud), the time-worn churches (including another WHS- the Paoay Church) and Marcos memorabilia are what makes the Ilokos province a gem of a place. From 'Historic Town' to 'Historic City of Vigan'. Vernacular architecture: the houses follow the typical plan of the tradional Bahay Kubo, with the second floor being the only living space. Most of the houses employ wood as one of the major materials in the construction. Ventanillas (lower sliding ventilators) only happen to manifest in the Philippines being a unique house feature. Name changes: From 'Historic Town' to 'Historic City of Vigan'.